The Exchange is the place to sell that old lawn mower or jet ski you've been wanting to get rid of, or find that piece of Klinger Lake memorabilia you've been looking for. Please note: we do not take any responsibility whatsoever for personal listings on the Exchange! We recommend that you only work with local buyers and sellers. One current scam involves people sending checks from out of state to buy goods. The checks invariably turn out to be worthless. Don't be a victim! As a reminder, all transactions are strictly between the buyer and the seller. We provide this service as a convenience to Klinger Lake residents. If there is something that you would like to buy or sell, please use the Personal Contact Form to tell us about it. Note; this is for personal items only and should not be used by businesses or those who are running any type of business or regular sale out of their homes. This section is for Klinger Lake residents to sell personal items. To list your items, we ask that you support the Klinger Lake Association. Please scroll down for the Items Wanted section. Please let us know when you've sold your item or no longer want it listed. To keep the ads current, we'll delete all listings older than 90 days unless you tell us that you want your ad to stay running. 14 foot KonaCat Catamaran Sailboat in good condition. Trailer included. Price is $1,200 or best offer. Just reduced! Call Dennis at 517-663-3893. Two red leather, 3 cushion, couches in good condition! Will sell separately or together! New furniture coming soon, must sell! $225. each or $400. for both! The couches are located in a house on the lake currently. Please call Trudy at 269-651-1924. Or you may contact her via email at bharnell@charter.net. 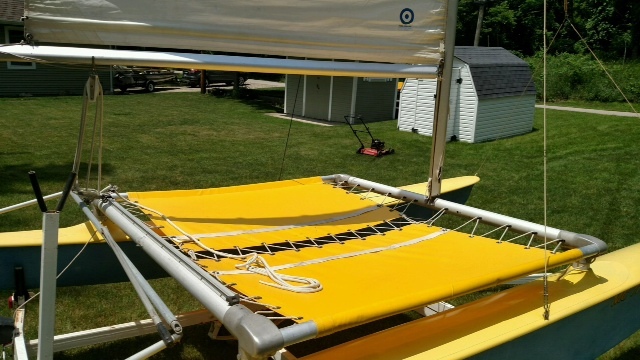 Flying Scot Sail Boat with Trailer and Hoist.$1500.The boat has been sailed and raced on Klinger Lake for more than 15 years. Please contact Roger Quinn at 269-319-6072 or 941-525-8997. Or you can email him at rogquinn@gmail.com. Harris Kayot deck boat 88 with trailer, 4.3 V6 IO, very clean, seats 10, $4,000, call 269-506-8270. 1956 Evinrude 30hp "Big Twin" electric start. Both engine and tank have been gone through, and everything replaced with new parts. Comes with engine stand on rolling casters and a parts motor. This outboard runs like a dream. Call or text for pictures. First $995.00 takes it home. Mishawaka, IN. Contact Joe Rapalski at 574 - 540 - 6110 or email him at jarapalski@comcast.net. Boat hoist for sale on Pine Bluff. It is manufactured by Shorestation. 3,600 lb. max. Newer cables. Has canopy frame; needs new vinyl canopy. It's in good condition. Price reduced to $2,000 OBO. If anybody is interested, please contact Terry via cell phone at 312-953-8710. You can also email Terry at terry@tmhlaw500.com. Single owner Optimus sailboat for sale. This is a great boat to learn in and can fit two children or one teenager. Asking $800 OBO. Beautiful Paddle Board For Sale - Convertible to Windsurfer! Check out this beautiful custom made 2013 Exocet paddle board-- 10.3 feet x 30.3 inches wide. It is light as a feather and converts to a windsurfer in a flash. Get the best of both sports with one board! It is in PERFECT condition. Asking price is $1100. Call Mark at 630-308-0007. I would like to trade my fully rigged Sunfish sailboat for a Windsurfer or other type of sailboard. Please email or call me! This section is for Klinger Lake residents who are looking to buy a particular item. The Exchange does not take responsibility for any items listed here-- all transactions are strictly between the buyer and seller. Please let us know when you no longer want your item listed. To keep the ads current, we'll delete all listings older than 90 days unless you tell us that you want your ad to stay running. Kim is looking for a cottage with 2-3 bedrooms right on the lake, preferably with a boat that can be rented for tubing and fishing. They would like to bring their dog if possible and a hot tub would also be great, but these are not deal breakers. Interested? Please contact Kim at kimberly_79@ymail.com. Looking for 4, 10' x 4' sections of used Con-De dock with frame and posts to add to our newly acquired dock. Please let me know if you or anyone else you may know might have these. Call Mark at 269-625-2018 or send him a message at Markmkirsch@yahoo.com. My friend Toodie Royer and I are both looking for old or forgotten skis. I know that many of you have skis in your garage or storage area that haven't been used for years. I am refurbishing them for a craft project so condition isn't important. I'm willing to pay some money for them if you believe they are worth it, but I can't afford much. If you have any water skis you can let go of I would greatly appreciate it if you would contact me. Any skis that I cannot use, I will let Toodie know about. Thank you in advance. Enjoy the lake!